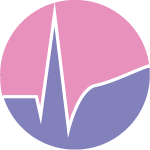 Pacemaker mediated tachycardia may arise if the pacemaker records a rapid atrial rate (e.g during a supraventricular tachycardia) and stimulates in the ventricles with the same rate. This occurs if ventricular stimulation is set to be triggered by the atrial impulse. Another cause of pacemaker mediated tachycardia is endless loop tachycardia, which also depend on the ventricular stimulation being triggered by atrial activity. In endless loop tachycardia the ventricular impulse manages to propagate to the atria where the atrial electrode records the impulse (and assumes that it represents an atrial activation) and thus triggers another ventricular stimulation. This cycle may repeat itself so that a tachyarrhythmia is established. Pacemaker beats are mostly easy to recognize on the ECG. Pacemaker stimulation generates a stimulation artefact (“pacemaker spike”). 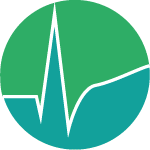 Older pacemakers generate large and clearly visible spikes, whereas newer models may generate very minute or even invisible spikes (at least in some leads). 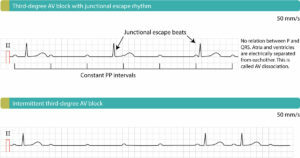 Pacemaker stimulated beats have wide QRS complexes and a left bundle branch block pattern on ECG; this is explained by the fact that the pacemaker electrode is placed and stimulates in the right ventricle. Hence, whenever a patient with a pacemaker presents with tachyarrhythmia and the QRS complexes appear with a left bundle branch block pattern, always suspect pacemaker mediated tachycardia. CRT devices (cardiac resynchronization therapy) may also cause tachycardias, and these devices produce slightly narrower QRS complexes (because they stimulate in both ventricles simultaneously). A tachycardia with Q-wave or QS complex in lead I suggests that the tachycardia is caused by the CRT device.